3M Wound & Skin Cleanser is an easy to use, gentle wound cleanser with zinc-nutrient formulation. It is a non-antimicrobial, no-rinse liquid with a zinc-nutrient formulation that provides a moist, mildly acidic environment conducive to wound healing. 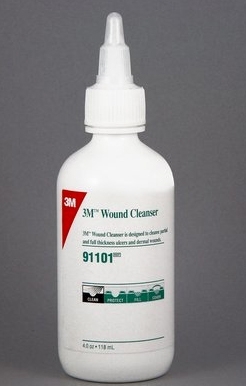 3M Wound Cleansers is non-cytotoxic and pH balanced. The gentle spray stream is consistent with guidelines for safe and effective cleansing. The fragrance free no rinse formulation is delivered in convenient easy to open easy squeeze bottles. It is designed to cleanse wounds such as pressure ulcers, abrasions, superficial partial thickness burns, open surgical incisions, venous ulcers, arterial ulcers skin tears, and neuropathic ulcers. Ingredients include: Water, dextrose, sodium chloride, preservatives (ethyl alcohol, methylparaben and propylparaben) and nutrients associated with wound repair (pyridoxine hcl, zinc acetate, zinc chloride, zinc sulfate).